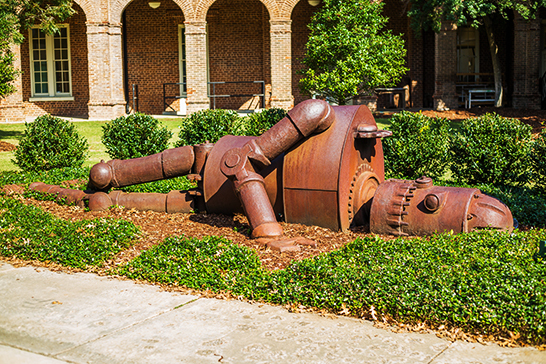 Woods Quad on The University of Alabama campus holds a surprise for passersby: A sculpture of a giant fallen robot with a personable Frankenstein-esque face and a Tin Man body. A study into the use of tobacco has yielded some interesting findings including dating the practice to around 4,000 years ago – about 1,500 years older than previously thought … We would also like to thank members of the University of Alabama’s Office of Archaeological Research for supporting our research by providing time, labor, and access to collections. More than the moment she became Miss Alabama, Callie Walker cherishes the moment that followed. After receiving her tiara, flowers and well-wishes June 9, The University of Alabama student took part in a reception by the Miss Alabama Pageant organization, where Walker was part of a group picture with other past Miss Alabama queens over the years. Next to her was her mother, Angela Tower Walker, who had been crowned in 1985. “It was such a special moment,” said Tower Walker, a ballet teacher at the Birmingham Dance Theatre. In his first week in office, President Donald Trump showed he intends to follow through on his immigration promises. A major focus of his campaign was on removing immigrants who, he said, were increasing crime in American communities … Robert Adelman, University at Buffalo, and Lesley Reid, The University of Alabama: Research has shown virtually no support for the enduring assumption that increases in immigration are associated with increases in crime. For more than a year and a half, U.S. Rep. Martha Roby has tried to fend off critics who say she bailed out on Donald Trump when he needed her most … The University of Alabama political science Professor Richard Fording said the endorsement was a surprise to him considering Trump’s rebuke of South Carolina Rep. Mark Sanford, a Trump critic who lost his bid for reelection earlier this month.